Blowing up Balloons by Vanessa Proctor and Gregory Piko ($US15 from Red Moon Press, 2017), 94 pages of haiku. Available from Vanessa or Greg, $A24 (including postage to New Zealand) through PayPal. 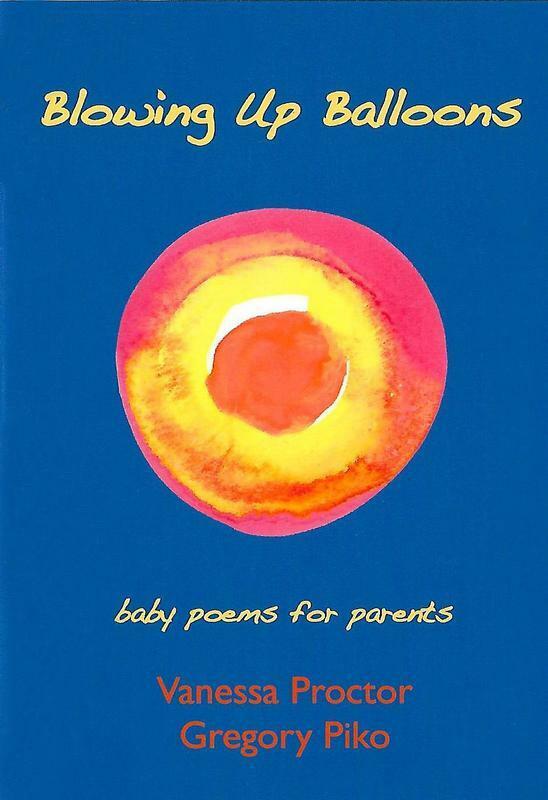 Two Australian haiku poets have together produced a delightful collection of haiku and senryu and done some clever marketing with their subtitle, ‘baby poems for parents’, as it won’t alienate anyone who becomes fearful at the terms ‘haiku’ and/or ‘senryu’. The risk with such a venture is the cloying sentimentality that often surrounds the production of small humans but Proctor and Piko steer clear of the trap with poems that share the moments of joy – and occasional panic and/or tedium – that make up parenthood. For some pregnancy is a shock, for others a planned event. But it can often be nine months that veer, for both parents, from contentment to terror as B-Day approaches. Bedsides all the dramas, large and small, and feelings of inadequacy, any parent (or grandparent) also knows about the unexpected humour that comes from having a tiny person with a sponge for a brain. None of the poems, which are presented one to a page, carry an author name nor are the poems assigned to an author in end notes. At first I found this slightly odd but after dipping in and out realised it may be a way of giving equal weighting to the roles of mother and father, and that both experiences and points of view are valid. And while some poems are gender specific, many are not which gives Blowing Up Balloons (BUB) a nice, cohesive feel. Cover art and internal colour art (which resemble balloons and separate roughly thematic sections arranged by baby’s development) is by Proctor. Some of the haiku/senryu have been published before, but there are also plenty that are being published for the first time. While many of the poems are gentle and revel in the magic of babies and childhood, neither of the authors is sentimental about the job of parenting – dirty work, long hours and no (cash) payment. It would be a delightful gift for anyone expecting a child or those with young children (so buy two and keep one). I hear you saying that the latter may not have enough time to enjoy it but I reply that among the attractions of haiku are its brevity and portability. Waiting for school to come out? Read a haiku or two. Nap time? Read a haiku or two (then get some kip yourself). Delightful surprise yesterday when I saw the results of the Martin Lucas Haiku Award – Second place! Apparently my letter of congratulations is still in the post (true statement, it seems they really have mailed the results). Judge Vanessa Proctor had this to say about my haiku: ‘Christmas eve’ presents the reader with a familiar domestic scene. It’s the night before Christmas when family members pull out those special Christmas books to read before the big day. Pop-up books are particularly magical, but this particular book is missing baby Jesus who is central to the story. How easily things can be lost. The wider message here is that in many ways the true meaning of Christmas has been lost too. I’d almost decided not to enter many more contests, my results having been poor over the past couple of years so this result has helped boost my confidence. And I’ve had a haiku published in a journal I haven’t tried before – Right Hand Pointing, an online US publication which has put out a couple of winter haiku editions collated by Eric Burke. And the latest Red Moon anthology is out – dust devils – which includes three of my haiku published in 2016. As you may recall, I’m a nominating editor for the Red Moon anthologies so what happens when it comes to editors’ own work is: The haiku we vote on are without names or publication points (so judged ‘blind’) and we may not vote for our own work. The work of editors must receive at least 5 votes from the other 9 editors to merit inclusion – meaning our own work is held to a slightly higher standard than general nominations which need at least 5 votes from 10 editors. News has come that John Carley (born 1955) has died in England, on January 1. John had had a serious illness for four years, something he bore with good humour and fortitude. I feel privileged to have known John, even if only by email and through shared writing online. His communication skills were second to none and he was one of the best teachers I have met. Thanks to him, my interest in renku is ongoing. He was also the best sabaki (renku leader) I have come across, patient, thoughtful and with the ability to see the whole poem even as we worked through its mysteries. His decisions were invariably sound and based in an expert knowledge of renku. His love of linked verse saw him invent the four-verse yotsumono, and he celebrated the form with a collection written with several authors, myself included, in The Little Book of Yotsumonos (Darlington Richards, 2012). The same publisher is bringing out the hard-copy edition of The Renku Reckoner, John’s life work, and taken from his now-defunct website of the same name. Thanks to a pdf version being available earlier, Vanessa Proctor has reviewed TRR on Haiku NewZ. John’s free e-book of haiku, nothing but the wind (Gean Tree Press, 2013), is available from the Calameo website or from The Living Haiku Anthology. No, thank you John … and we won! (Icing on the cake, as he reckoned he’d taken some risks with verse choices considering it was a competition entry, and an American competition at that.) Read Early Morning Heat. There are several articles by John on Basho, renku, kigo and other topics available online (Haiku NewZ, A Hundred Gourds, etc) and I urge you to seek them out and read them. I feel like I’ve lost a mentor, a guiding light and a dear friend. I can’t imagine what his family must be feeling (typical John, though, he arranged for an email to be sent to advise of his death) and my thoughts and good wishes are with them and with the others, like me, who mourn him.